Lenders are reducing mortgage qualification requirements by the day. 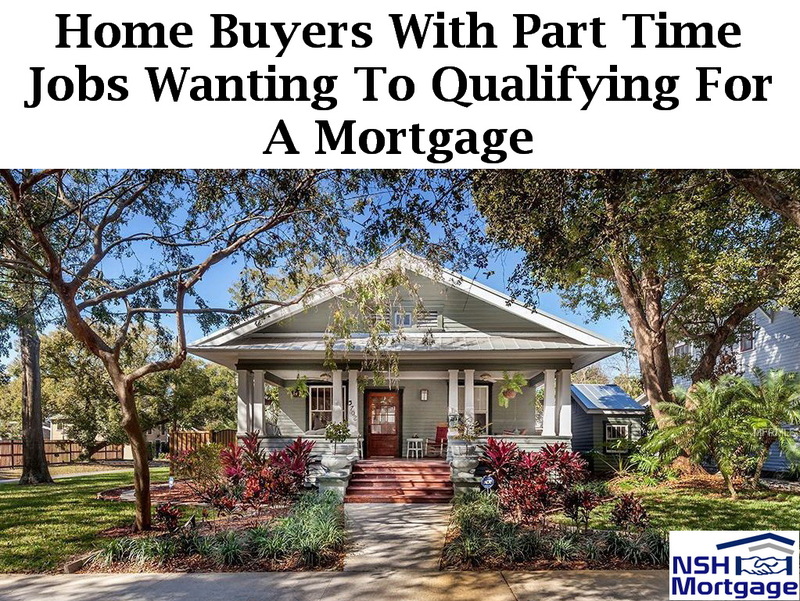 Home buyers with part time jobs qualifying for a mortgage. NSH Mortgage has the wisdom and tools in finding how much you will need to afford a mortgage. Home buyers are discovering they can qualify for aggressive new programs like HomeReady™ thanks to flexible guidelines and low mortgage rates. Accessible home-ownership cannot be attributed solely to new programs, however. Years old guidelines are helping too. One of those rules are regarding income from part time jobs. Applicants who work one or more part time jobs can use that income for mortgage qualifying. Part time income rules are commonly straightforward. With a small amount of extra documentation, applicants can buy a home without a full time position. Part time employment is an essential source of income for workers around the country. In December 2016, more than 32 million Americans worked 34 hours or less per week, according to the Bureau of Labor Statistics. These workers are possibly closer to home buying eligibility than they realize. Lenders can accept income from part time employment for most individuals with adequate work history. This is true whether they have a single part time job or a second job besides full time employment. If someone with two jobs applies for a home loan, they will need to fill out a few more forms of documentation that will be submitted to their lender. Time on the job is the key factor. Most lenders need to see a two year history of the second part time job. Before, they will count it towards the total income in qualifying for a mortgage. In addition, they will want to see the applicant has worked two jobs simultaneously for two years. This history can be documented with W2s from both employers. You will also gather your last three to four pay-stubs from both jobs to show current earnings. Lenders must ensure that the applicants can maintain two jobs and has not taken on an unsustainable workload. If an applicant has been working both jobs for two-years, the lender will assume they can continue to do so. Some home buyers who have flow of income from a single part time job. They can use this income to qualify for a home as well. The guidelines are different and less restrictive if you have a part time job as your sole source of income. For instance, a nurse who works 24 hours per week will verify income the same as a 40 hour per week office worker. Neither of these employees would need two years of work history necessarily. The lender only needs enough information to determine that the income is stable and likely to continue. A home buyer’s history of related employment or education is often enough evidence of stable income. Each circumstance is different, so applicants should check with their lender if they are unsure if their income will help them qualify. The two year rule is not set in stone. Sometimes, part time income guidelines are flexible. If you have had a part time or second job for less than two years, present your case to the lender that the income is likely to continue. Request a letter from your current employer stating your value to the organization and that your position is stable. If you cannot show your that job is stable and you have not worked there at least two years. Your lender may still consider the extra income as a compensating factor. This means your income can help you be approved even though the lender cannot officially use the income for qualification purposes. Part time income is not always usable, but certainly worth asking your lender about. Sometimes, you just need a few more months of employment history. Or, an explanation letter from an employer to use your income from a part time job.